If your kitchen cabinets are in good shape, but have an outdated finish or color, giving them a new coat of paint will dramatically improve their appearance. Before you purchase your paint, though, keep in mind that paint you'll use on your cabinets can have an impact on the job's outcome. Each has its own advantages and disadvantages for use in the kitchen. Oil-based paint is more difficult to work with. It requires good ventalaition in the kitchen and mineral spirits for the clean up. It does, however, give you a very hard, durable finish that is tough to duplicate on your cabinets with latex-based paints. Latex paint is easier to work with; it has lower VOCs and cleans up with soap and water. It can leave your cabinet doors tacky for a long time while it dries, however, and the finish may not be as durable or last as long. The biggest advantage to using spray paint in your kitchen is the ease of application. It leaves no brush marks, goes on fast and dries even faster. 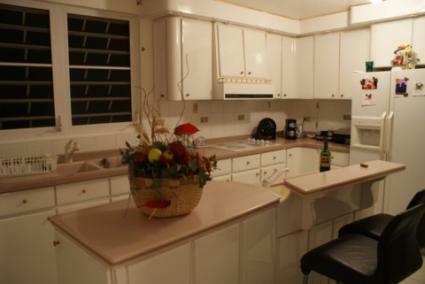 Some companies, such as Rust-o-leum, even make paint that is especially for kitchen cabinets. It can be messy, however, requiring you to tape off everything in the general area, as well as ventilate the room well. Paint finishes come in gloss, semi-gloss, satin, eggshell and matte, any of which can be used on your cabinets. Gloss and semi-gloss - Both create a shiny appearance, making them great for trim. They wipe up quickly and easily, which can make them attractive for some busy kitchens. Satin and eggshell - Both have a very slight shine and they hold up well to cleaning. Matte/flat - Reflects little light, making it great for covering up imperfections on the surface. It can be very difficult to clean, however, leaving your cabinets open to staining and scuff marks. Choose your paint based on the material or finish of your cabinets: stained or painted wood, metal or melamine. Some paints, like Chalk Paint, can be applied directly over a stained or painted wood with no sanding or stripping required. Other paints are made specifically for metal finishes. Melamine should always be painted in an oil-based paint following a primer to help the paint adhere to the ultra-smooth finish. Always paint a small test sample on the cabinet first, to ensure the paint takes and looks the way it should. Painted cabinets can transform your kitchen, giving new life to your cabinetry. Select the right paint for your space to ensure they continue to look great for years to come.